Created with an eye to as faithful a re-creation of Howard's tales as possible, grab a sword and prepare to tread kingdoms under your sandalled feet. 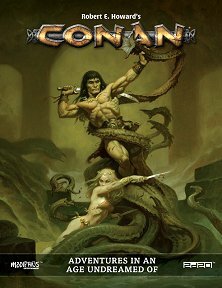 Publisher's blurb: "Robert E. Howard's Conan: Adventures in an Age Undreamed Of takes you into the world of Conan the Barbarian, where heroes raise blood-spattered swords against dire sorcery, exotic lands beckon to the daring, danger and treasure lurks in forgotten ruins, and where loathsome creatures haunt the spaces beneath the earth... as well as in the throne-rooms of mighty kingdoms! "Seek your fortune in forbidden tombs or upon blood-soaked battlefields. Cast dark and terrible spells of unimaginable power, at the price of your soul. Sail upon untamed seas to lands where no human in living memory has walked. Fight for the fate of civilization - or barbarism - on a savage frontier! "Create your own legend in this decadent and violent world."